Marvel Heroes 2015 is getting its roster bolstered even further, introducing Magik, a sorceress with a massive sword and a stupid, incorrect name. Her big brother is Colossus, though, so I’d never say that to her face. 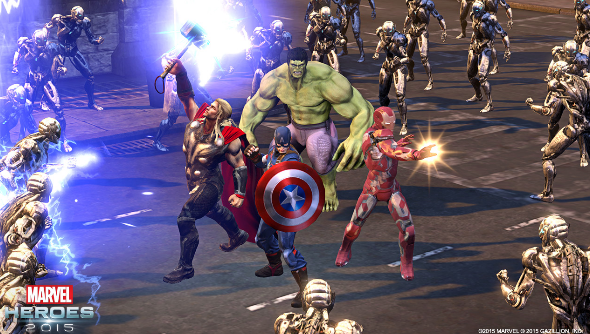 There are big plans for Marvel Heroes in 2016 – read about them here. Magik herself is formidable enough, mind. In the comics, Magik can teleport herself and others through time and space itself, so it’ll be interesting to see how these powers translate to the game. She’s also spent time in another dimension called limbo and is haunted by the creatures that exist in that plane, often inadvertently summoning them when she uses her powers. Luckily, she’s pretty handy with a sword, so you could always just get stabby if you’re feeling like maybe you should stop summoning hellspawn for a minute. In the comics, that sword gets more powerful the more it’s used, too, so swing away.